So being that it’s March — basketball’s biggest month — we figured what better way to kick off our monthly Riderz Law “Biker Spotlight” than with a spirited young lady from the great “Hoosier” state of Indiana. I chose to take the Riders Edge class on the fist Mothers Day after my Mom’s passing to distract me. Little did I know that it would change my whole disposition. A little over 3 years, and 19,000 miles, I am a new woman. Last summer I dipped my toe into the drag racing pool. 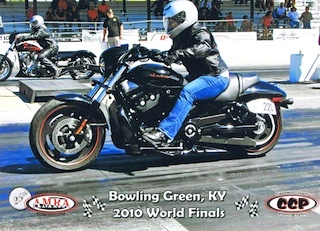 My very first real race was at the AMRA Fall Finals in Bowling Green, KY. Talk about baptism by fire! I actually won the first round, and broke out in the second. (As far as I’m concerned, giving the guy next to me a 2 second head start and still beating him at the finish line is a win to me, even IF I went ‘too fast’!) This year I plan on hitting 4 AMRA events, 3 in Kentucky, and one in Michigan. The plan is to hook the bike up with nitrous *big cheesy grin* — with the help of the guys at Valley Racing in Beecher, IL. Can I mention that I’m looking for sponsors for AMRA races? 3 events in KY, 1 in GA, MS, and MI. Oh yeah, and go to www.beltdrivebetty.com and vote for me in the “Real Lady Riders” calendar contest, you can vote once every 24hours, voting ends on the 16th of March! And check out my friend Cindy at StyleSaverScarf.com. I won’t put a helmet on without one. Thanks Sharon! Give us a holler next time you ride out this way. We would love to meet up — and see if any of us can keep up with you on that V-Rod! And thanks to everyone else who has sent in pictures so far. We’ve gotten submissions from a lot of cool people and great-looking bikes that we would like to share on our website in the future.